New York University Press, 9780814727881, 256pp. 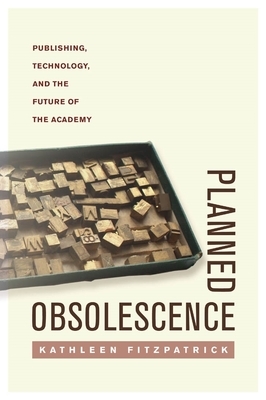 Planned Obsolescence is both a provocation to think more broadly about the academy's future and an argument for reconceiving that future in more communally-oriented ways. Facing these issues head-on, Kathleen Fitzpatrick focuses on the technological changes--especially greater utilization of internet publication technologies, including digital archives, social networking tools, and multimedia--necessary to allow academic publishing to thrive into the future. But she goes further, insisting that the key issues that must be addressed are social and institutional in origin. Springing from original research as well as Fitzpatrick's own hands-on experiments in new modes of scholarly communication through MediaCommons, the digital scholarly network she co-founded, Planned Obsolescence explores these aspects of scholarly work, as well as issues surrounding the preservation of digital scholarship and the place of publishing within the structure of the contemporary university. Written in an approachable style designed to bring administrators and scholars into a conversation, Planned Obsolescence explores both symptom and cure to ensure that scholarly communication will remain relevant in the digital future. "Academic Publishing and Zombies" - Inside Higher Ed.